I did this project for a friend and client last year but haven’t been able to share it until now because it was destined to go into print competition at our annual Texas Summerfest program last Sunday. That competition is over and I’m happy to repeat that not only did it “merit” (scored an 80), but it also received a distinguished print ribbon which means it was in the running for the best album in its category. This came about when Ashley contacted me about doing her and her husband’s annual portrait. She was expecting, so they wanted to do something for the baby’s room. 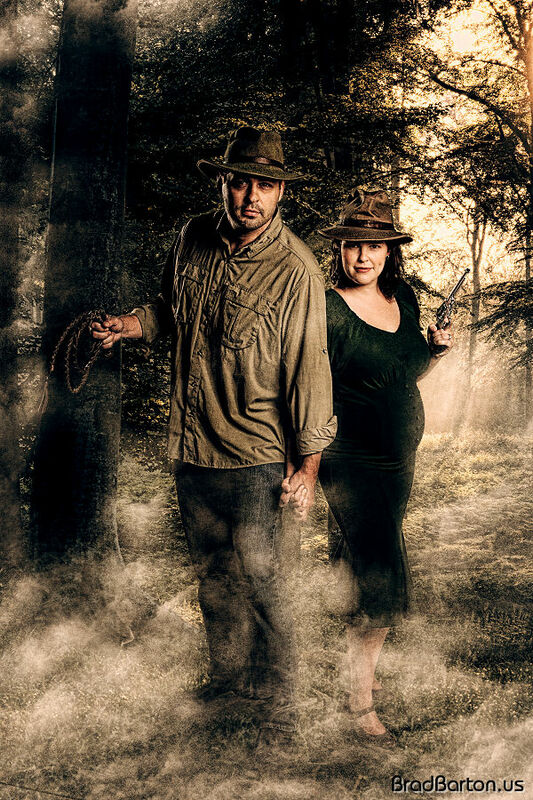 Her husband, Dan, loved the adventure images I’ve done in the past (in particular the Carmen Sandiego cosplay image) and since the baby’s room was going to be decorated in an adventure theme, they wanted to do that for their portrait. That finished image is the above cover image. But I didn’t stop there. Conspiring with our mutual friend and her studio partner, Meghan, we decided to try and sneak an entire storyboard’s worth of images into our session. They were suspicious as I shot so many different things with them, but they were told not to ask too many questions. The final result? A one of a kind storybook they can read to their son. I wrote the base story and Meghan fleshed it out and laid it out. We had it printed as a leather covered album with a compass embossed on the cover. Even though Ashley is holding a compass near the end of the story, in the original image, she was actually holding a small piece of photo equipment – so she had no idea what it would be. As a final bit of “special” to add to the entire thing – I included the compass with the entire thing and the album and compass were given to her at her baby shower. Needless to say, it was an incredible success… and will hopefully be a secret treasure for many, many years to come. Here are the layouts from the final results and a picture of the album itself.